This is the official MLBlog of the Houston Astros for their fans. Join your fellow fans and leave Milo any congratulatory comments here! 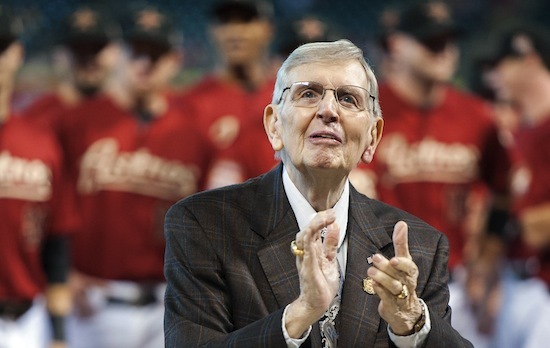 Astros Hall of Fame radio play-by-play voice Milo Hamilton, who announced in February the 2012 season would be his last in a full-time role, will announce his final game at Minute Maid Park on Wednesday’s home finale against the Cardinals. Hamilton, 85, has been in broadcast 67 years, including more than 50 in the Major Leagues with stops in St. Louis, Chicago, Atlanta, Pittsburgh and Houston. He’s been with the Astros since 1985 and plans to remain active in the community even if he’s not at the ballpark daily. Hamilton, who has been calling primarily home games since 2006 and gave up television earlier in his Astros career, still plans to make occasional guest on-air and public appearances, as well as emceeing baseball events around Houston. He wants to broadcast the team’s series next year at Detroit’s Comerica Park, which would be his 60th ballpark from which to call a game. The Astros will also honor Hamilton at the Blue Star Gala, which will be held on the field at Minute Maid Park on Oct. 16. The night will be a gathering of many former Major League players, including baseball legend and Hall of Famer Hank Aaron, whose record-breaking 715th home run was called by Hamilton in 1974. The club invites fans to share memories and thanks in the comments below.